Pre-season has begun for many teams in leagues across the world with friendlies and mini-tournaments being held in many continents and it is no different for the new team in the Norfolk Business Houses Saturday League, the Anglian Knights FC. Last night was the first training session for the team, which proved to be a successful evening. My main aim of the evening was to get warmed up, then have a 7-a-side game to get a gauge on the ability of each individual and get an idea of formation and positions for the season ahead. After a jog around the 11-a-side pitch (3 times) which went down brilliantly with the team, we got straight into a game of 3 touch football and no goalies, just a mini goal to pass the ball through. This made for a quick moving game of football, improving your first touch, quick decision making and passing accuracy. It also meant that it was better to keep the ball on the floor to pass and move to create space. We did this for about 30 minutes, which was quite tough on some of the players who haven’t played for a few years, as it meant lots of movement and because it is a quick game it tires you out even faster. However, the guys all worked hard and battled competitively to win, which is a good indicator into the mentality of the team. No-one wanted to lose and I like that, I don’t want a team of players who are happy to just play, I want players who have the drive and desire to do their best and get the result the team wants! With kit on its way and friendlies arranged it was good to get the first training session out of the way. The season is fast approaching so from now we train hard and do our utmost to improve and gel as a team. 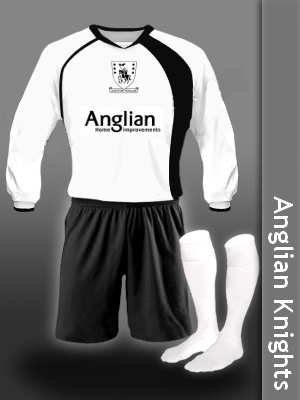 The Anglian Knights first friendly is on the 8th August Kicking off at 6.30pm against Jubilee Rangers. The Jubilee Rangers won the Norfolk and Norwich Business Houses Saturday League, Division 2 last season, so although it is only a friendly it is guaranteed to be an entertaining game. Feel free to come along and support the team, it would be a welcomed boost for all the lads. Anglian Home Improvements supporting communities across the UK. Visit the Anglian website for information on our A-rated EcoGain windows.